I am so excited to write this post! We have finished our half bath remodel and it looks like a whole new bathroom. I am so happy with the way it turned out. My husband is amazing for going along with all my design ideas and implementing them perfectly. He worked so hard on this room and I love it! Here is what our bathroom looked like before. The bathroom was livable. It had a working toilet and sink and was clean. But as far as style was concerned, it was far from mine. I had visions of clean, light, simple, and a touch of farmhouse charm. We went back and forth on replacing the vanity or not, and ultimately decided it needed to go. 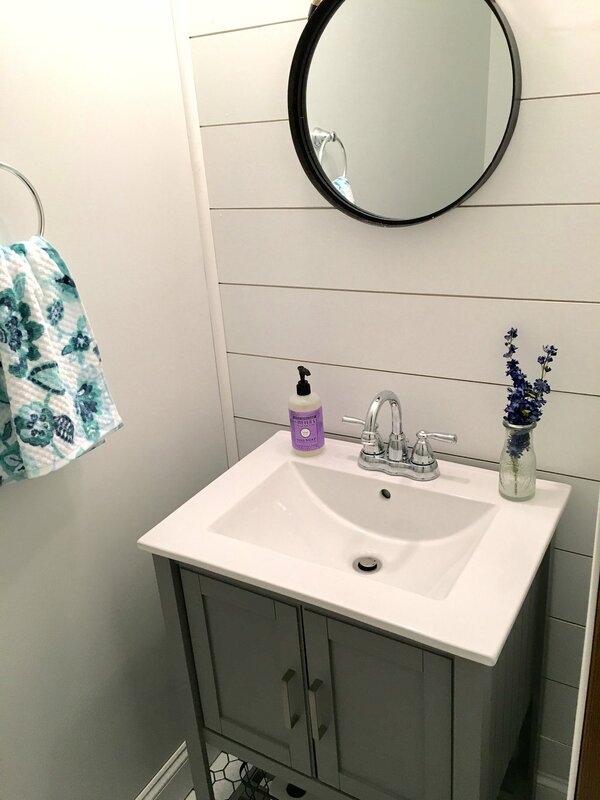 New floors, paint, vanity, and a new toilet were all on our list for this bathroom project. I knew what I wanted and we got to work! By we I really do mean John. I helped some with the shiplap and trim, but other than that it was really a one person job. The room is so small only one person could be in there working comfortably at a time. This is our half bath now. I am so happy with the way it turned out! It is exactly how I envisioned it. I got my shiplap (happy dance) and it looks great! It took me awhile to pick out the paint color and I love what we chose. We used Sherwin Williams Fleur De Sel. It's a perfect light grey that makes the room feel larger than it is. We are going to replace our outlets and light switches so that they are white. We also have a new light fixture coming, it was delayed by about 3 months, and that will be the final touch. I will link all of our items at the bottom of this post. I will do another post going through the whole process, more of a step by step. I will also be doing a shiplap tutorial. This was our first time installing shiplap so we are no experts, but I will share how we did ours for anyone who is interested. We had so much fun designing and doing this project ourselves. I'm excited to start our next project!